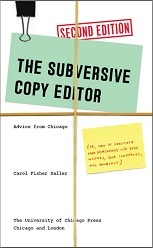 Today Lucy Ferriss and I continue a conversation we started on Wednesday about why copy editors do the things they do. Lucy: What is with the love of italics? Again, this peeve applies mostly to the personal essay or fiction. If the internal monologue or remembered bit of conversation is clearly designated as such, I prefer to keep it in roman. All that italic makes me feel as though people are either whispering or shouting. I see increasing amounts of italic for imagined conversations, what a character wishes he’d said, and so on. Is this a new guideline? Or is it more often something you see authors doing, rather than editors? Carol: In my experience, it’s more authors than editors. Editors are taught to avoid the use of italics, both for emphasis (a sign of hack writing) and for text (which is hard on the eye). But authors love italics! I’m constantly removing italics used for stress, for internal dialogue, and even for entire block quotations. Chicago style uses quotation marks for long quotations of foreign languages, but writers often use both quotation marks and italics. Lucy: Must we keep capitalizing words like Internet, Linoleum, and Dumpster? When do we get to decide they’re become generic? Changing these to proper names introduces a distraction, in my view. And who decides that, for instance, in speaking of Catholics, Masses is capped whereas sisters is lower case? Carol: Publishers might claim that there are legal issues that dictate uppercasing trademarks, but ultimately one’s style manual or house dictionary determines capitalization. I know it’s frustrating and difficult to understand the reasoning behind the styles listed in a manual—often because there isn’t any. In fact, you’ll find considerable disagreement between guides. If two styles are equally valid, the writers of a style guide have to choose arbitrarily, and once a particular style is codified it tends to perpetuate itself (at least until the next edition). But any editor worth her salt will cooperate when a writer objects in a given instance. It’s easy enough to search a manuscript to lowercase a word—unless the editor has lowercased something like he used for God. Lucy: My second novel appeared with an embarrassing, though sidelong, reference to there being tigers in Africa. I got plenty of ribbing about the fact that the only tigers in Africa would be found in zoos. Stupid me, of course, but after I’d been teased a dozen times for my blooper, I started blaming the copy editor. After all, aren’t writers supposed to be the brilliant inventors, and copy editors the dull safety nets? All kidding aside, how much, if any, responsibility do you think the copy editor should accept for a gaffe like that? Carol: It depends. When a copy editor takes a job, the hiring party is supposed to make clear whether fact-checking is expected. Very often, it isn’t. It’s possible that your editor was technically responsible only for making sure that Africa was spelled correctly. On the other hand, most copy editors find it hard to resist checking facts—it’s so darned easy, and so gratifying to find errors. What’s more, the line between editing and fact-checking is easily blurred: If I’m checking the spelling of the Wrights’ first plane, the Kitty Hawk, I’m going to find out willy-nilly that Kitty Hawk was actually the town where the plane (which was named the Wright Flyer) was tested. In the case of the tiger goof, I hope the copy editor was mortified not to have caught it, because it’s common knowledge, even if it checking it wasn’t part of the job. Originally published as “Help Me Understand My Copy Editor: A Lingua Franca Dialogue, Part II,” at Lingua Franca blog, Chronicle of Higher Education, July 13, 2012.